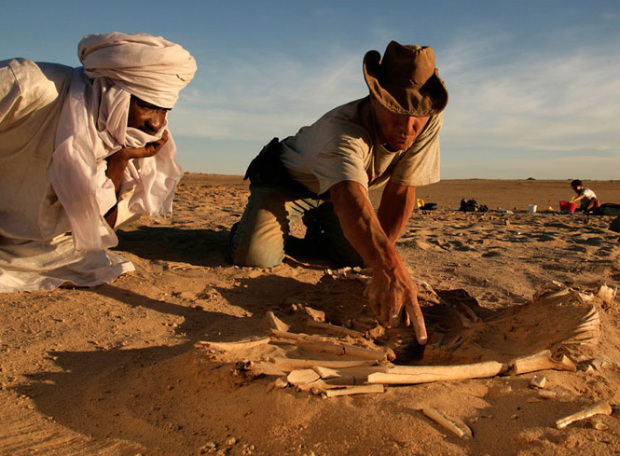 The “Gobero Project” began in 2000, after paleontologist Paul Sereno, PhD, and his team made a chance discovery of a burial from the Holocene—an epoch that began 11,700 years ago—in the heart of the Ténéré Desert in central Niger. The site is now recognized as the largest and most exceptionally preserved early-to-mid Holocene archaeological site in all of the Sahara, and provides a unique opportunity to study how human populations adapted to changing climate during the African Humid Period. Sereno, a professor of organismal biology and anatomy at the University of Chicago, and his team recently gave nine lectures on Gobero at the Society of Africanist Archaeologists (SAfA) Conference in Toulouse, which attracts most of the Africanist archaeologist community from around the world. Sereno’s presentations raised numerous questions and fostered lively discussion from attending scholars and students that led to two major discoveries: why Gobero was able to sustain 5,000 years of recurring human occupation, and that international students and colleagues have been implementing Sereno’s practices for excavation that he shared at other conferences. Read more about the Gobero Project, and many of Paul Sereno’s other discoveries, on his website. The above post is reprinted from materials provided by The University of Chicago Medical Center. Are urban black males shortchanged in classroom?